This coming weekend, on either the 17th or 18th of October the council will be hosting an informal coffee meeting to get the guilds thoughts on what you want out of HoT, which guild hall you want MYST to go for and when you are free to do this mission. We want as many people as possible to be taking part as i think it's a one off mission and want as many people to experience it as possible. We thought it was best to get everyone opinions on these matters as it will affect you all. The point of this post is to see what days and times are good for people this weekend, what points you want to bring up in the meeting, and if you are unable to make it, to write anything down that you want to be taken into account during the meeting so your voice is heard. Especially if you cannot make it please write something here or let one of the council know anything you want us to know, either privately or in here, the main thing i think will be when is best to do the mission and which guild hall you want. This is all of the information i could find, certain things like the images are worth looking at to see which you would prefer, its not expected for you to read everything as theres a lot of information but it is useful. I can't make it (moving that weekend), but I'm all over the Gilded Hollow still. It's not ADD, it's just-- look, a squirrel! Tom and I are off golfing Saturday. I have no idea what is currently happening after that, so not sure on evening availability there either. Sunday will be more likely on our end, afternoon most probably. Working all weekend, though I'm probably there on sunday eve. There's talks around here that we might get a family visit over the weekend. But not certain yet. I should be able to join you guys during the evening for certain though. As for the guild halls itself, I can definitely see us sitting cosy in that Gilded Hollow. Read a few of the posts; slightly curious to see where they'll be taking the scribe role and how everything will look & feel, especially the Tavern, Mine & Workshop. Location: Somewhere in the green bowels of Belgium called "Brakel"
I've got choir practice on saturday morning so will be back somewhere later afternoonish and should be here from then on. Gilded Hollow it is. I should be able to make it on saturday or sunday, someone might have to remind me to log in though. Also sven suggested doing a L4D event this weekend as well and it would be great if the the meeting would be at a different time than that zombie carnage. Real Badasses Eat Chocolate Chip Cookies. Was hoping for a few more reponses but as you say time is short, seems like more people will be free Sunday. So i'm unable to make the meeting, but Ku and Cinna will be there to share all. Here comes the summary of our coffee meeting. We met sneakily in the guild building in LA which features a very cozy fireplace in the big library. Only seating options were a bit sparse which led to a certain amount of stacking on the only couch. There will be a video / live stream of the capturing for those who can't attend either due to time issues or because they don't own HoT. Feedback about the last meeting was positive. People feel like communication and getting responses when asking things in guild chat have increased. Guild influence should be kept to speed up building times in the guild hall. Only merits will become useless. 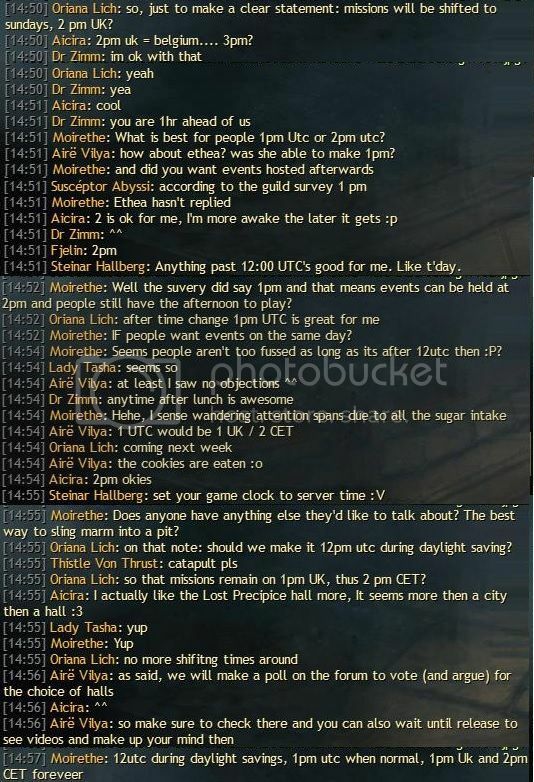 To round things off here a few impressions of our meeting including screenshots of the chat to read up on everything for those who missed it. I was thinking, maybe a list of attendees could accompany the meeting minutes? The chat shows who spoke, but not necessarily who was there (either in the main company or on a different map). Also, the chat names are character names, rather than player account names, which can be a bit confusing if one (like me) is unfamiliar with the character/person (I found it very difficult while reading thru the screenshots of the previous meeting to work out who was speaking because of this, and in some cases I am still unsure. Also, I know people were present who didn't speak). A list of attendees would also help with knowing who is able to attend and/or take an interest in the meetings. I notice your summary points include a decision regarding the times of the Sunday missions. "Light thinks it travels faster than anything but it is wrong. No matter how fast light travels, it finds the darkness has always got there first, and is waiting for it."